Based on Viking Age poems, The Saga of the Volsungs combines mythology, legend and sheer human drama. At its heart are the heroic deeds of Sigurd the dragon slayer who acquires runic knowledge from one of Odin's Valkyries. Yet it is also set in a very human world, incorporating oral memories of the fourth and fifth centuries, when Attila the Hun and other warriors fought on the northern frontiers of the Roman empire. 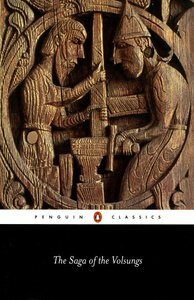 An illuminating Introduction links the historical Huns, Burgundians and Goths with the events of this Icelandic saga, whose author claimed that Sigurd's name was 'known in all tongues north of the Greek Ocean, and so it must remain while the world endures'. With its ill-fated Rhinegold, the sword reforged and the magic ring of power, the saga resembles the Nibelungenlied. It has been a primary source for fantasy writers, such as William Morris and J. R. R. Tolkien, and for Richard Wagner's Ring cycle. About "Saga of the Volsungs"